Muscular dystrophy is a term that refers to a group of muscle disorders in which the face, arm, leg, spine, or heart muscles gradually shrink and weaken over time. Muscular dystrophies are characterized by progressive skeletal muscle weakness, defects in muscle proteins, and the death of muscle cells and tissue. Apart from the nine major types of muscular dystrophy listed above, several MD-like conditions have also been identified. Normal intellectual, muscular, behavioral, bowel and sexual function is noticed in individuals with other forms of MD and MD-like conditions. MD-affected individuals with susceptible intellectual impairment are diagnosed through molecular characteristics but not through problems associated with disability. However, a third of patients who are severely affected with DMD may have cognitive impairment, behavioral, vision and speech problems. MD can affect people of all ages. Although some forms first become apparent in infancy or childhood, others may not appear until middle age or later. Duchenne muscular dystrophy is the most common form affecting children, while myotonic MD is the most common form affecting adults. Symptoms vary with the different types of muscular dystrophy.All of the muscles may be affected. 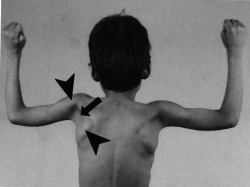 Or, only specific groups of muscles may be affected, such as those around the pelvis, shoulder, or face. Muscular dystrophy can affect adults, but the more severe forms tend to occur in early childhood. Classical Acupuncture is one of the finest treatment methods by proper diagnosing and without any medicines for MD. In Raaja’s ACUAROGYA clinic we have dealt with these kind of problems and we have given satisfied results to the patients with the help of classical acupuncture techniques.